The COBB GT-R Anti-Sway Bar kit was developed using sound motorsports engineering principles and further validated by hundreds of miles of on-track testing and competition on the COBB GT-R Time Attack car. Overall roll stiffness is increased which allows the driver to attack the corners, rewarding him with razor sharp turn-in response, reduced mid-corner understeer and improved corner-exit balance. This all translates to increased confidence while driving the GT-R at its limits! 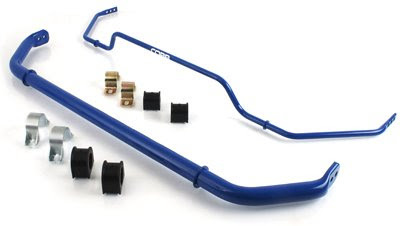 The COBB GT-R Anti-Sway Bar kit has multiple settings both front and rear, giving additional adjustment so handling can be tuned to driver preference. The tubular design allows significant rate increases (up to 94% over stock) with a minimal weight penalty of only 2.7 pounds. The included polyurethane bushings eliminate flex and provide immediate transient response that the driver can feel. This kit is a direct replacement for the factory equipment and works with all of the factory undertray pieces. The mounting hardware and factory endlinks are retained while new mounting straps designed for higher loads are provided front and rear. The lightweight tubular bars are CNC bent for exceptional quality control and perfect fitment. Integrated locator rings retain the bars in their proper position and prevent walking during high G cornering maneuvers. This kit is also compatible with the ultra-adjustable COBB GT-R Coilover Sleeve system. The COBB GT-R Anti-Sway Bars complement the GT-R’s awesome power with exceptional balance and make the turns as exciting as the straights! From Cobb Blog. Say that 4 times fast. Stiffer is better. Adjustable is better.